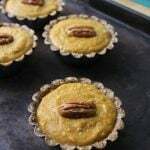 This recipe for no bake vegan and gluten free pumpkin pie tarts will be a crowd pleaser during the holidays. It’s incredibly easy to make! Pumpkin pie has never been my favorite dessert. In fact, pie used to have its own category on the list of foods I didn’t like – and for no good reason. There are still a few kinds of pie that I don’t love… sugar creme, chocolate, and banana creme come to mind. I think it’s a texture thing. I’m on the fence about pumpkin pie, though. It’s one of those recipes that was a no-brainer for the blog, but I’ve just never been a big fan. I am a firm believer that everything tastes better in miniature form and my theory proved true with this pie. For the past 23 years of my life – or however long I’ve been able to lift my own fork – I’ve let the pumpkin pie pass me by at Thanksgiving. Not this year. I will be snagging at least one of these after dinner, and maybe stashing one away for later. I’d probably still choose prefer a slice of hot apple pie, but this pumpkin pie would suffice. The flavors are just right. 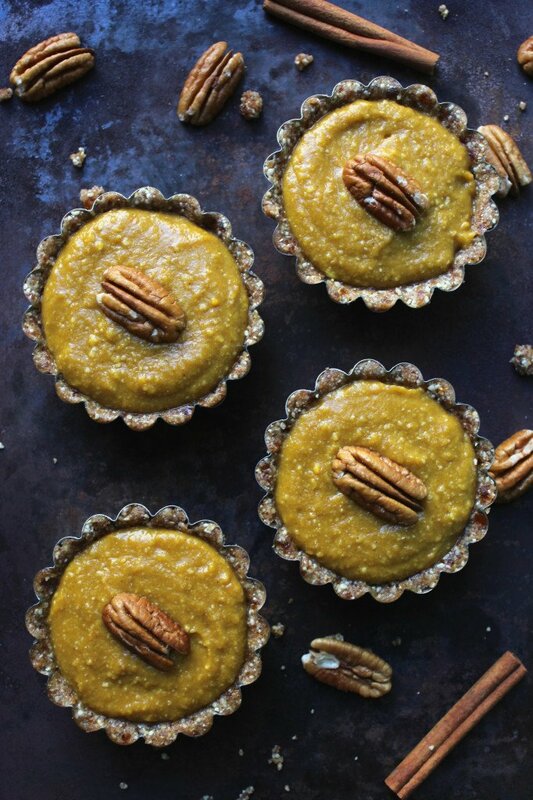 Cinnamon, nutmeg, and obviously, pumpkin, on a slightly-sweet crust of crushed pecans. It’s almost like combining pumpkin and pecan pie, now that I think about it. No one will ever know that it’s not laden with butter, heavy dairy, and sugar. That creamy texture? You can thank avocado for that. There is usually plenty of refined sugar and processed junk floating around at most holiday gatherings, so this is a nice repreive. It’s just big enough to fill the dessert hole without putting you into a coma. I don’t know about everyone else, but I would be pretty thrilled to get my own miniature pie at any kind of holiday gathering. Something about it just feels so special. Top with a single pecan or, if you’re feeling fancy, coconut whipped cream. 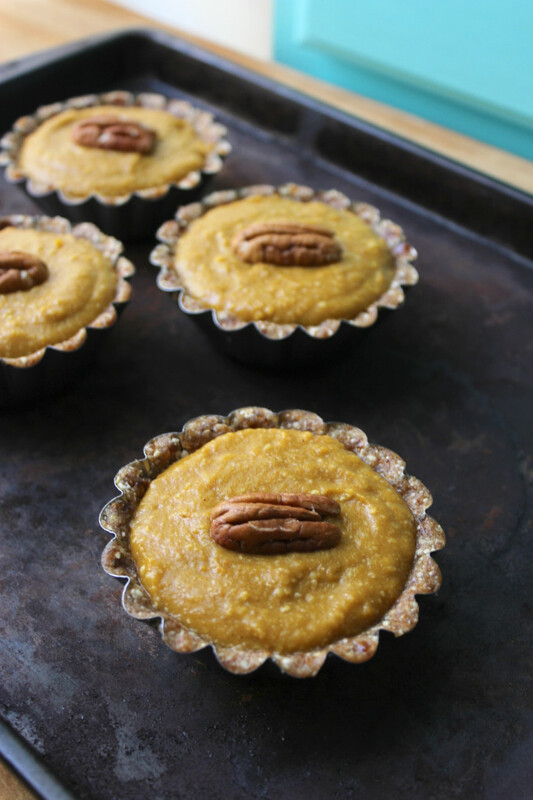 Easy, delicious, and adorable pumpkin pie tarts. A new spin on the traditional dessert. 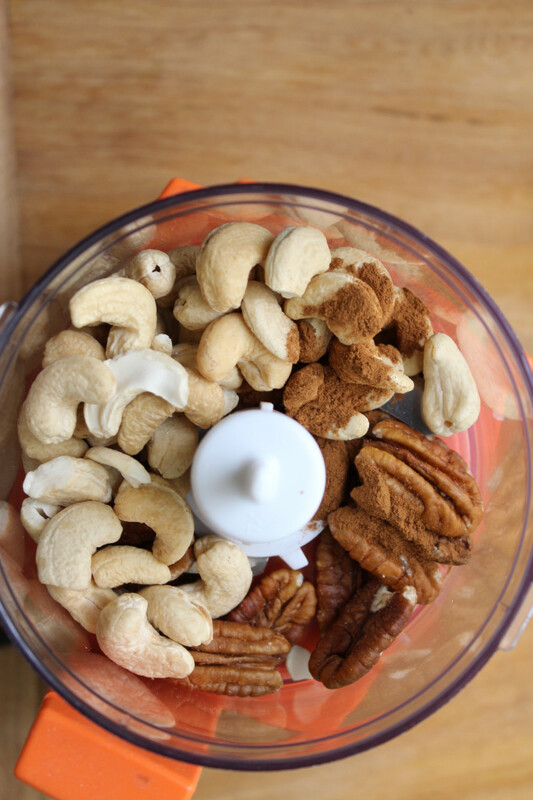 Add 1/4 c. pecans and 1/2 c. cashews to food processor. Pulse until nuts are broken down. Add dates, apricots, and cinnamon. Pulse until well-combined. Lightly grease the tart forms. Divide crust equally between and press the mixture down into the forms. Place crusts into the refrigerator while making the filling. First, add 1/4 c. cashews to food processor and pulse until smooth. 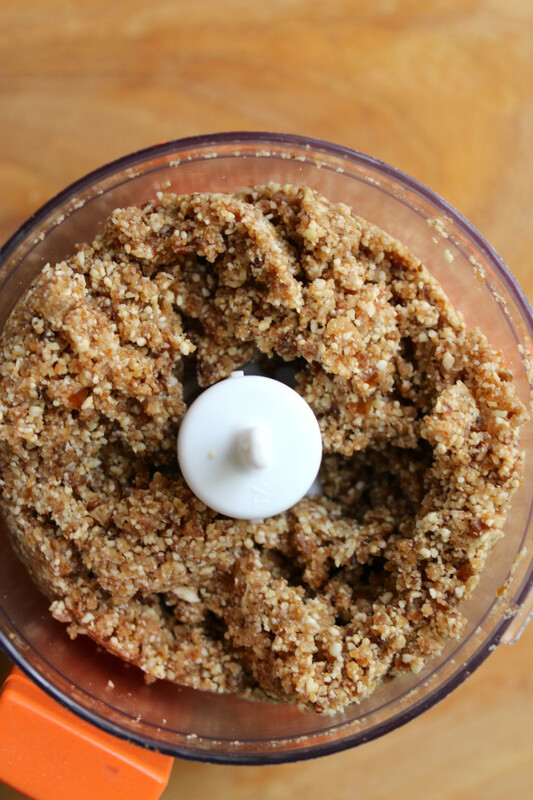 Add the remaining filling ingredients to the food processor and blend until well-combined. 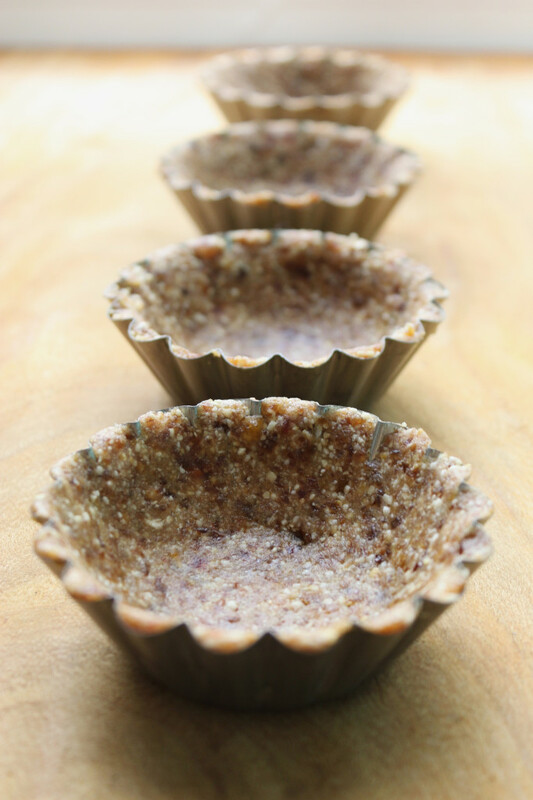 Spoon the filling into the tart cups. Cover and place in the freezer for 1-1.5 hours. I’m so excited to make these for Christmas. Where did you get those adorable tins? 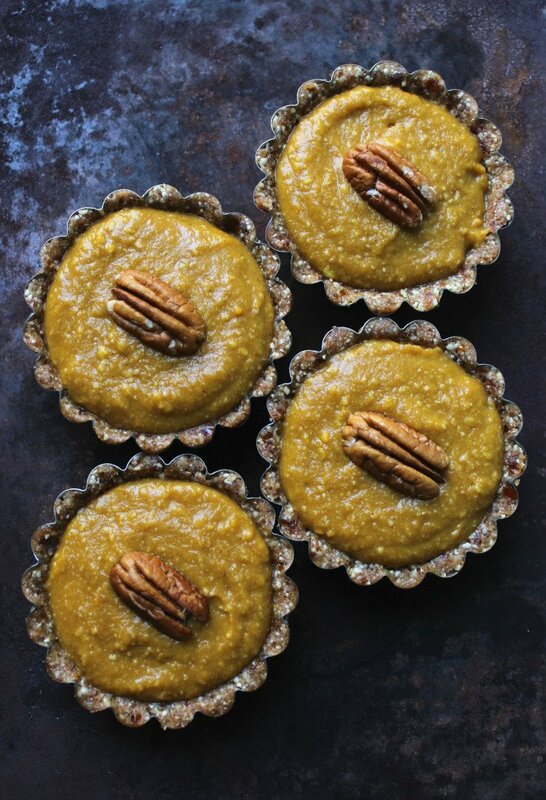 Pumpkin Pie Tarts look quite tasty! Hey! :) Thank you! It could also make one big pie if doubled. 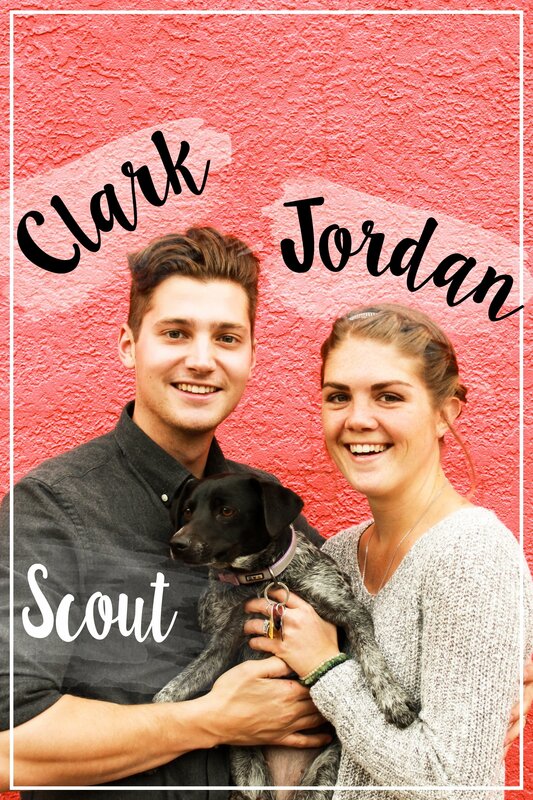 Can’t wait to see you guys next week! yum!! and gluten free? It’s too good!